Here's a tutorial on how to string a guitar properly. Replacing guitar strings is not rocket science, but there are some things you've got to keep in mind. If not done properly your guitar will detune repeatedly. String Brands: choosing a guitar string brand comes down to personal taste. Try out some different brands to find out what brand suits you the most. String Composition: what are strings made of? Most strings (electric and acoustic guitar strings) are made by winding a "wrap wire" round a high-carbon steel hexcore wire or a metal wire. The material used for the wrap wire determine how the guitar strings sound like. Nickel: the best-selling type of electric guitar strings (for example: D'Addario XL). Stainless Steel: provides a brighter tone (for example: D'Addario XLS). Phosphor Bronze: provides a warmer tone, used for acoustic guitar strings (for example: D'Addario Phosphor Bronze). Nylon: classical guitar strings are made of nylon. String Gauge: the diameter of your strings. Guitar strings come in sets and most of the time sets are referenced by the diameter of the first string (for example .009) or the first and the last string (for example .009 - .042). Values like .009 are the diameter measured in inches (.009 inch = 0.23 mm). 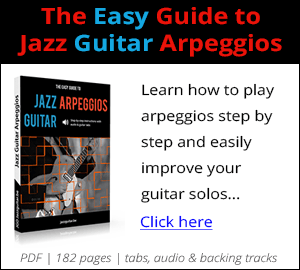 Jazz guitarists usually play on heavy sets (.012 - .054) because they produce a louder and thicker tone and have more sustain. Disadvantage is that heavier sets are harder to press down to the fret board and harder to bend. For beginning guitarists it's better to use a lighter set, they are easier to handle and they don't give you sore fingers. An important thing to remember is that when you change to a string set with a different gauge, your guitar neck and intonation need to be readjusted (more about this in a later tutorial). Heavier strings produce more tension and therefore pull more relief into the guitar neck. Round wound: uses a round wire. This type of winding gives brighter sound, but produce more extra noise. Flat wound: uses a flat ribbon wire. This gives the strings less resistance and less extra noise because they have a smoother surface, but they produce a duller sound. Start with removing the strings. There is a bit of conflicting information about this: some people say you'd better not remove all the strings at once because the loss of tension wil l cause your guitar neck to warp or even snap in some cases (may be true for very cheap or old guitars). I never had problems with removing all the strings at once. Guitars are manufactured without strings and luthiers will often remove them when doing repairs. This is a good time to polish the guitar. Polishing is best done when changing guitar strings after you removed the old strings so they don't get in your way. For the body of your guitar use a professional polish like Ernie Ball Guitar Polish. For the fret board use olive oil, linseed oil or walnut oil. Secure the 6th string to the bridge or tail piece of your guitar. How this is done depends on the brand and type of guitar you have, but is usually straightforward. Align the tuning peg with the nut slot and pull the string through the hole of the tuning peg until there is about 2" (5cm) between the string and the fret board (when pulling the string up). This allows for about 3 windings on the tuning peg. Avoid excessive winding, it may cause the strings to slip and detune. Bend the string to the right and put it underneath itself where it goes in the hole (see pic). 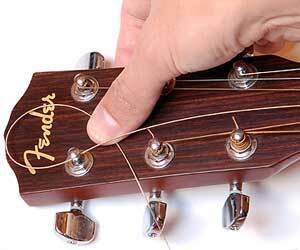 Give the string a sharp bend upward and keep it that place while you turn the tuner in clockwise direction. Tune the string to the right pitch with a guitar tuner. Make sure the windings go down from the top. Now stretch the string by pulling it upward at it's midway point. This increases the stability, new strings go out of tune easily. After stretching, tune it again and do some more stretching. Repeat this until the string doesn't detune anymore. Cut the excess string with a wire cutter or a toenail clipper (that's used for string cutting purposes only). Don't cut them too short or the string will come loose, but don't leave it too long either, string ends are very sharp and you may hurt yourselves. Repeat this process for the other 5 strings. Wash your hands before your play your guitar and wipe down your strings with a dry cloth after each use. Doing this helps a great deal to preserve string longevity. Also keep your fret board clean and oiled. 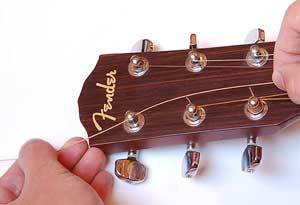 If you break a lot of strings, look for sharp edges on the bridge, saddle or tuning pegs. Sometimes your string gets stuck in the nut slot , especially when tuning down. 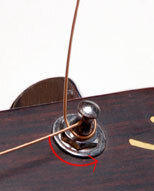 You can solve this by putting a bit of flake graphite in the nut slot (under the strings) to remove friction so the string can slide more freely. You can easily get flake graphite by scratching the lead of a pencil with a knife. Change your strings when they loose their brilliance and intonation. The life span of a guitar string depends heavily on how much you play and on how well you take care of them. Don't replace a single string in a used set when you break a string. The sound of the new string will be completely different compared to the other strings.